KIEV, Ukraine -- Police fired teargas on Wednesday to disperse opposition activists protesting outside city hall in the Ukrainian capital following scuffles that injured four officers. Riot police officers use teargas to disperse Ukrainian opposition activists as they try to enter the building of the city council in Kiev. 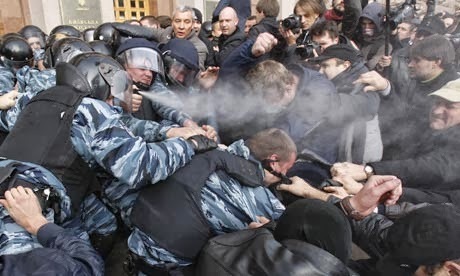 Kiev police chief Valery Koryak said that police used the teargas after one officer was dragged into the crowd and beaten. The officer was hospitalised with a head injury, while another three officers were also hurt in the violence. About 200 opposition demonstrators had gathered outside the Kiev city hall to protest against a court ruling extending the authority of the current city legislature. The opposition is pushing for a vote to elect a new legislature.